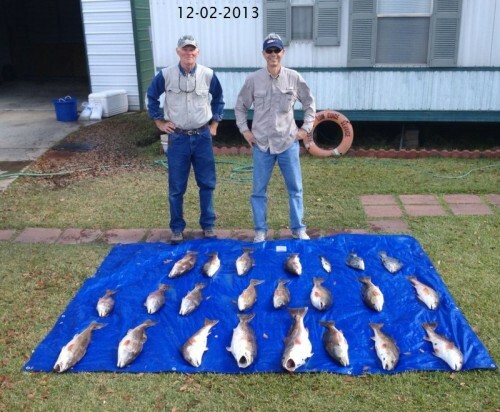 12-18-2013 Howard L. & Friends Hank & Andy Catch Some Nice 2 to 3 Pound Lake Calcasieu Trout!!! And Andy’s Monster 20 lb Red!!! 12-18-2013 Howard L. & Friends Hank & Andy Catch Some Nice 2 to 3 Pound Lake Calcasieu Trout!! Plus some Reds , BlackDrum and Hackberry Halibut to finish off a Great Day on Big Lake!!! 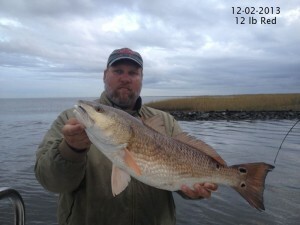 Andy spent 20 minutes fighting this 20 lb Monster Redfish!!! 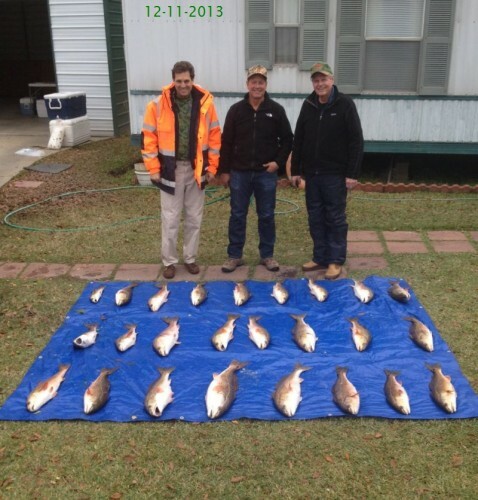 12-11-2013 Steve S. & Friends Greg & John Catch an Incredible Limit of Lake Calcasieu Reds!!! 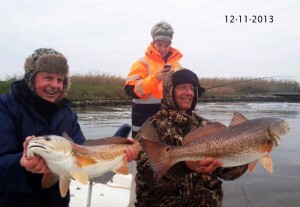 12-11-2013 Steve S. & Friends Greg & John Catch an Incredible Limit of Lake Calcasieu Reds!!! We also caught about 30 more that where over 27 inches and released them to fight again! 12-05-2013 Big Slam Day!!! 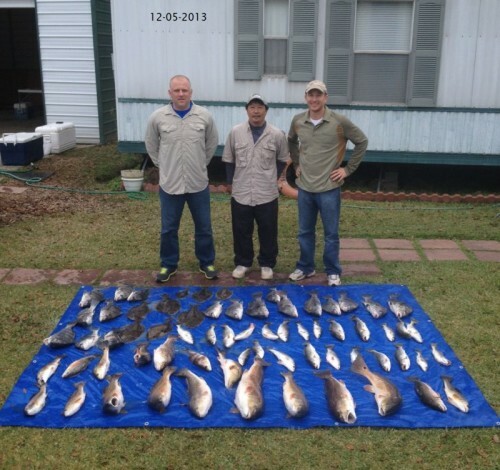 Howard L. & Friends Hank and Andy Have an Incredible Day Catching Some of Everything Lake Calcasieu Holds!!! 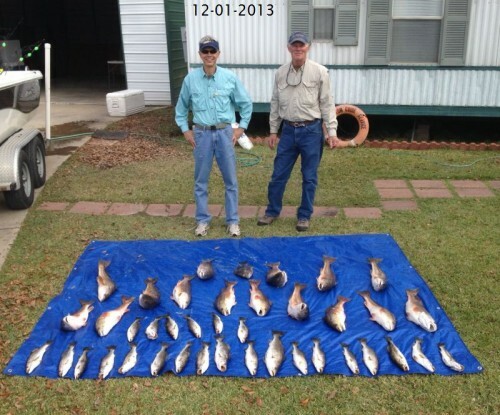 December 02, 2013 Leighton M & Tracy Catch Limit of Lake Calcasieu Bronze Beauties By 7 AM !!! 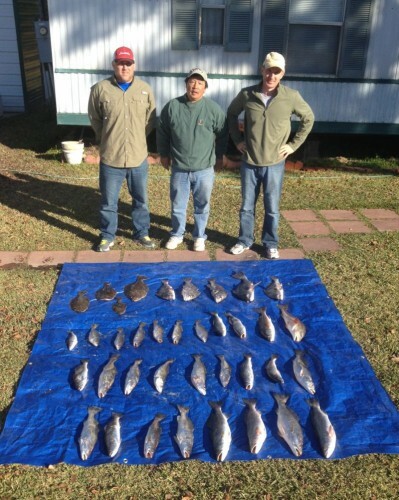 December 02, 2013 Leighton M & Tracy Catch Limit of Lake Calcasieu Bronze Beauties By 7 AM !! Then they cought over 100 more they released to fight again!!!! It was an Incredible Day of Catching on Big Lake!!! December 01, 2013 Early Christmas Present!! 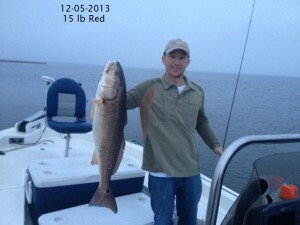 A limit of Nice Reds Plus 24 Nice Specks for Leighton M. & Tracy!!! December 01, 2013 Early Christmas Present!! 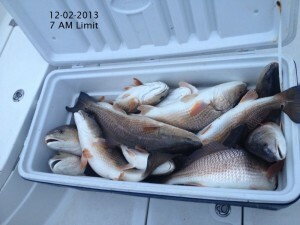 A limit of Nice Reds Plus 24 Nice Specks for Leighton M. & Tracy!! 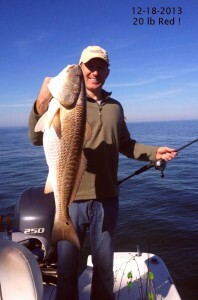 We caught and released another 60 Five pound Reds for and Incredible 1oo + Keepers boated by Noon!!! !